I posted about this in the General forum, but I figured I'd direct my more specific issue here. 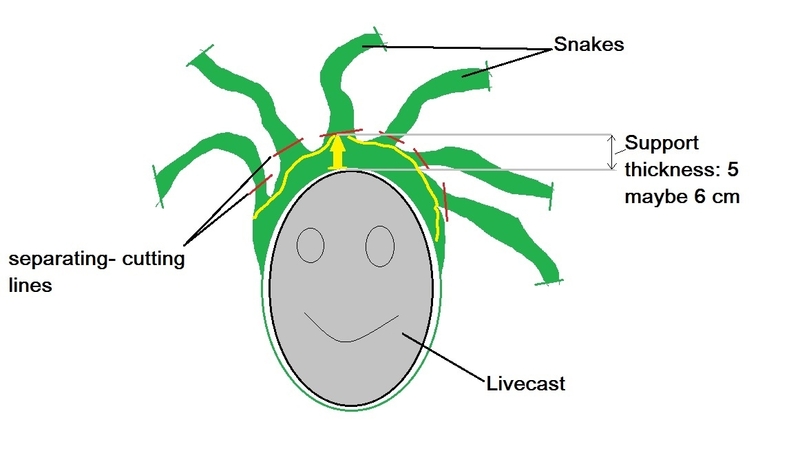 I'm turning my wife into Medusa for halloween, only problem is I'm kinda new to all this and I'm not sure what to use for casting the snakes and skullcap to go on her head. I'm not going to mix a bunch of fake snakes into her hair. It's going to be completely covered and look something more like Medusa from the recent Clash of the Titans. I want to have the snakes coiled and posed, so it'll have to be rigid, but all sit on her head in a stable fashion. I plan to do silicone prosthetics for scales around her body, but what should I use for the snakes and cap on her head? I searched for some pictures of your subscribed medusa. If i would do that project, i would sculpt the whole mask over your wifes livecast, separate the snakes and doing molds of them. Also a core mold from the mask and cast that stuff in foamlatex because its lightweight, stretchy and stiff (when the material is thick enough) together. The foamlatex snakes could be supported with thin aluminiumwire to bring them in form. The last step would be to glue all parts together, seeming the lines and paint them. Edit: For time saving, you could sculpt only one snake with a base of that diameter, that you want. Instead of sculpting every snake on the head, you only block out the bases in the same diameter, your sculpted snake has. So you could make a few casts of that snake and glue them on the bases of the head. As I mentioned in the other thread, I would go with fiberglass for the skull cap. If you are not comfortable with mixing up resin and laying fiberglass, you could try using water-activated fiberglass bandages (used like plaster bandages for making casts), which might do the trick.